John E. Thompson, lecturer in fine arts, is fulfilling the position of acting department chair for the Department of Fine Arts while Susan Moore, associate professor of fine arts, takes a semester of sabbatical this fall. 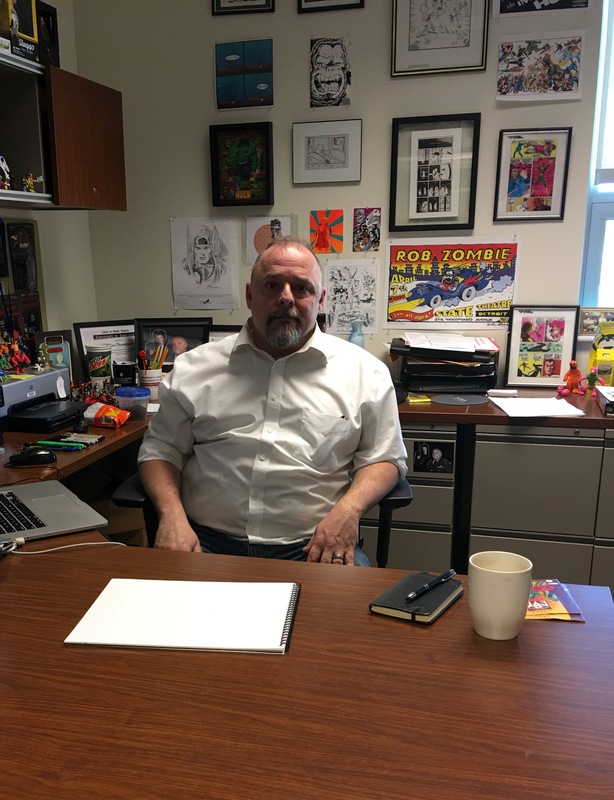 “Thompson came to IU South Bend with a rich background in college classes, military service, being published in National Lampoon, and dream chasing—including an educational but discouraging bus ride to New York to submit his portfolio to DC and Marvel. When he began teaching here as an adjunct professor in 2012, he was finishing his MFA in interactive design and game development from Savannah College of Art & Design. Now, just last year, he has become a full-time lecturer in fine arts. Thompson teaches a variety of classes, in both fine arts and new media. His demeanor exudes the approachable, relaxed, and often hilarious personality that you might expect of a life-long comic enthusiast. In the classroom, Thompson immerses his students into fun and challenging work, balancing his vast artistic knowledge with clear instructions and patience. With his work as an instructor, his passion for creativity in his own work continues. To learn more about Thompson, his character Doctor Brain, as well as more about the Ernestine M. Raclin School of the Arts faculty and students pick up a copy of 2017’s Aspire magazine.